Puerto Morelos Blog: Clocks forward 1 hour tonight! Daylight Savings Time goes into effect on April 6th at 2 am. 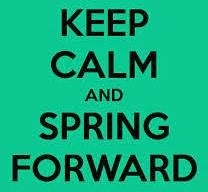 So, set your clocks ahead 1 hour tonight! We'll be falling backward 1 hour at 2 a.m. on October 26, 2014.